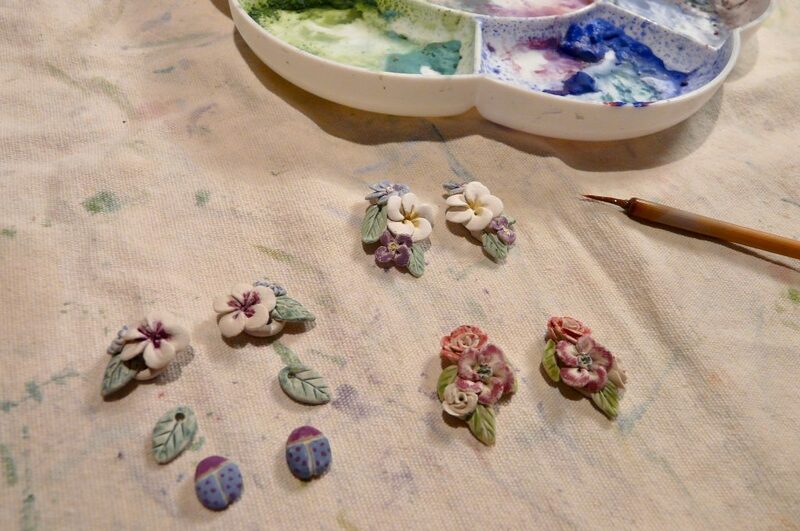 On these wintry days I’m slowly working on a new Spring collection of porcelain jewellery. Today we had the first snow of this year. Where I live, it’s only a thin powdery layer of snow as other parts of the country have much more. Nevertheless, it looks beautiful! 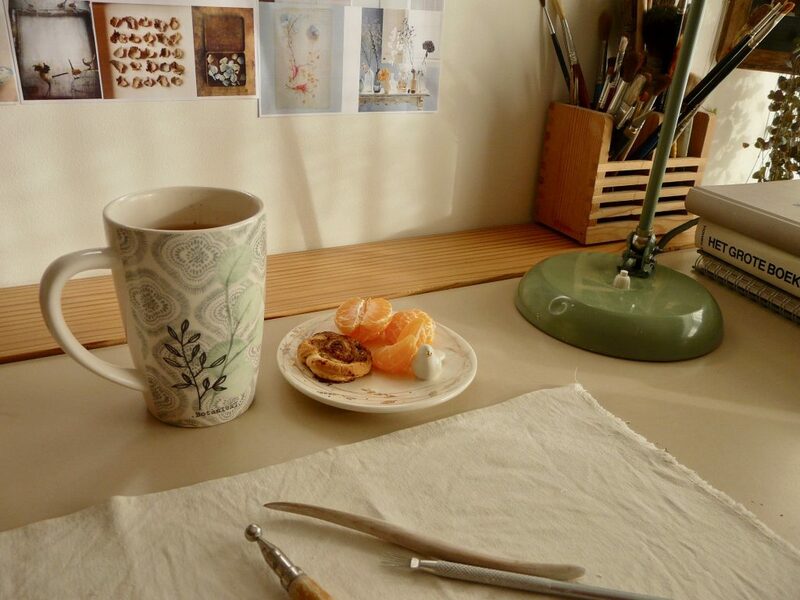 With a cup of my herbal tea, fresh tangerines and a homemade cardamon biscuit made by our eldest daughter, I start working in my studio. Yesterday we had a very sunny day. I loved the bright light that shines inside my studio and made shadows on my wall! 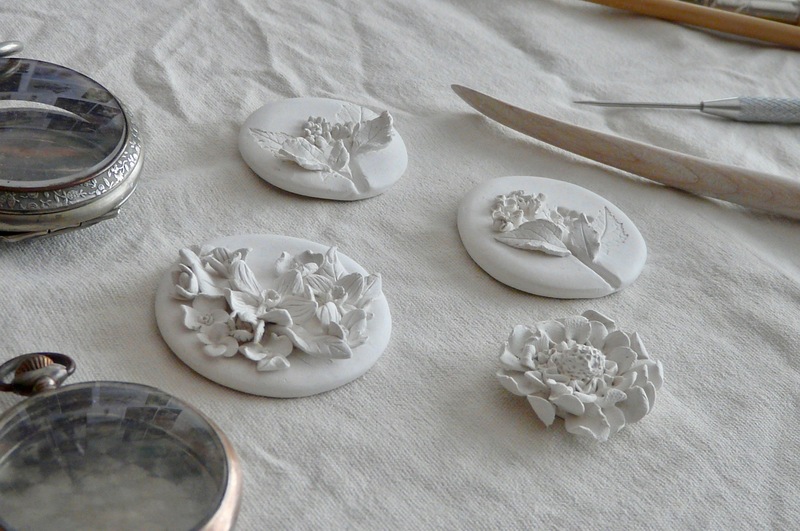 I’m currently working on porcelain jewellery, inspired by wildflowers. These creations will become my new Spring collection for 2019. Drawing and painting wildflowers and making combinations of possible leaves and flowers. 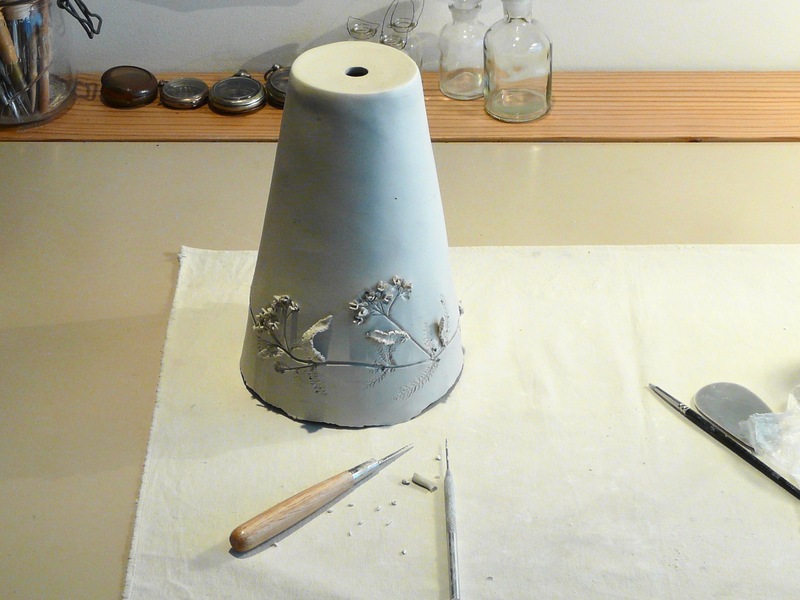 And also figuring out how to apply the silver parts after firing, to attach everything into one piece of jewellery. 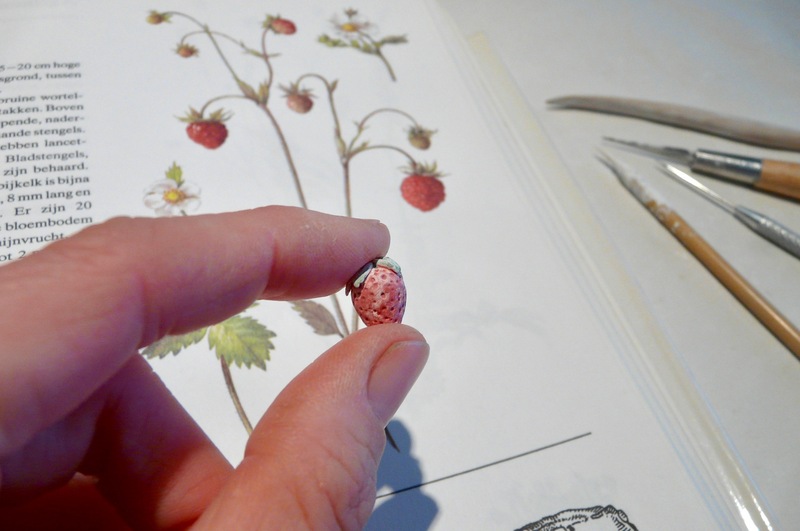 Tiny strawberries will be among the new earrings. I hope you would love to wear these vivid red sweet ones on a spring day! 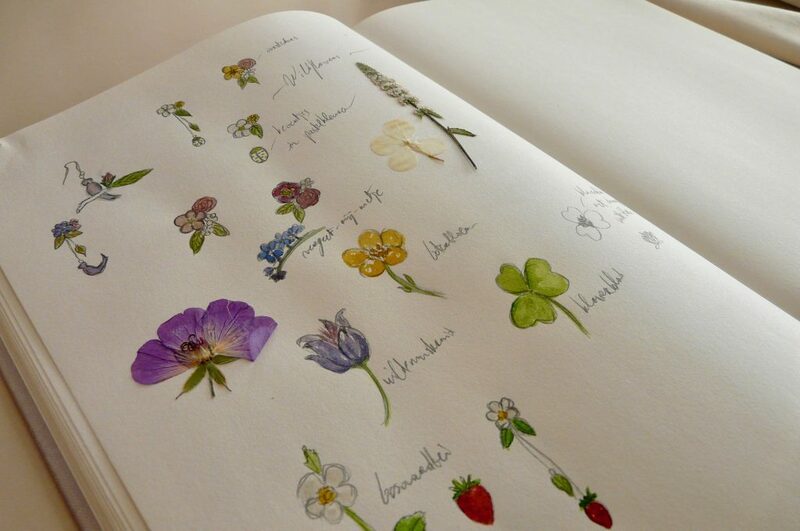 I use an old handbook of botanical wildflowers to get inspired for the shapes and colors of the new flowers I’m making. Little flowers and leaves in happy spring colors! I’m really missing the colors and green hues outside so I think that’s why I made my own colors. 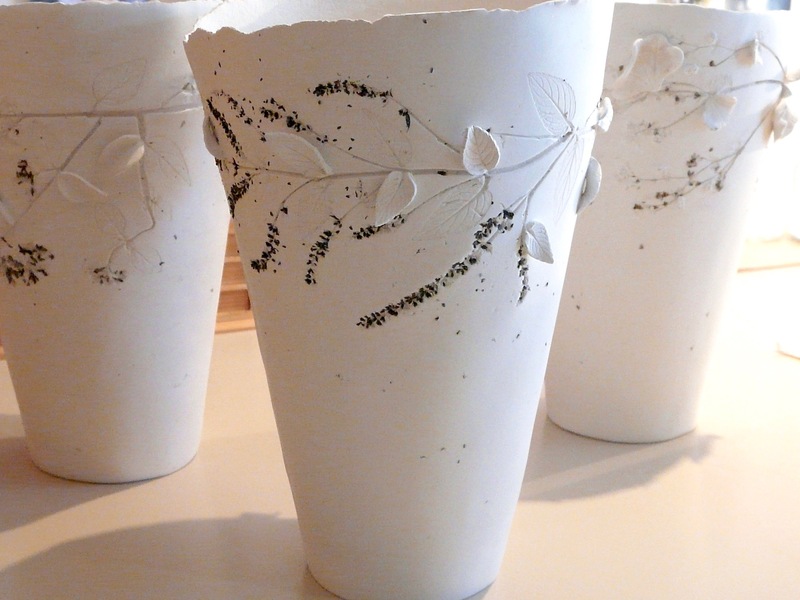 It makes me joyful to create and color new flowers on these grey days. Even Spring is far away, I love to make these flowers who perfectly fit into a Spring world! 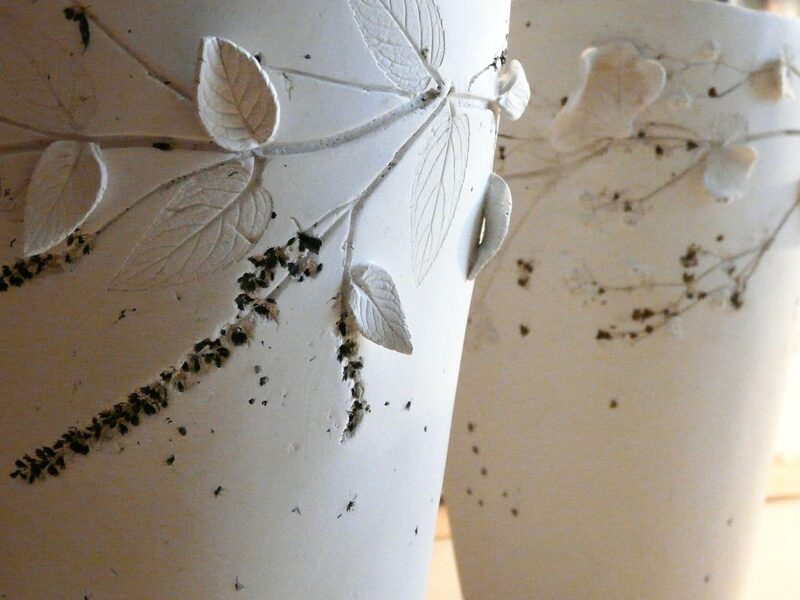 In the new collection I will even make tiny insects, like these fairytale like beetles. On a flea market I bought some old watches. 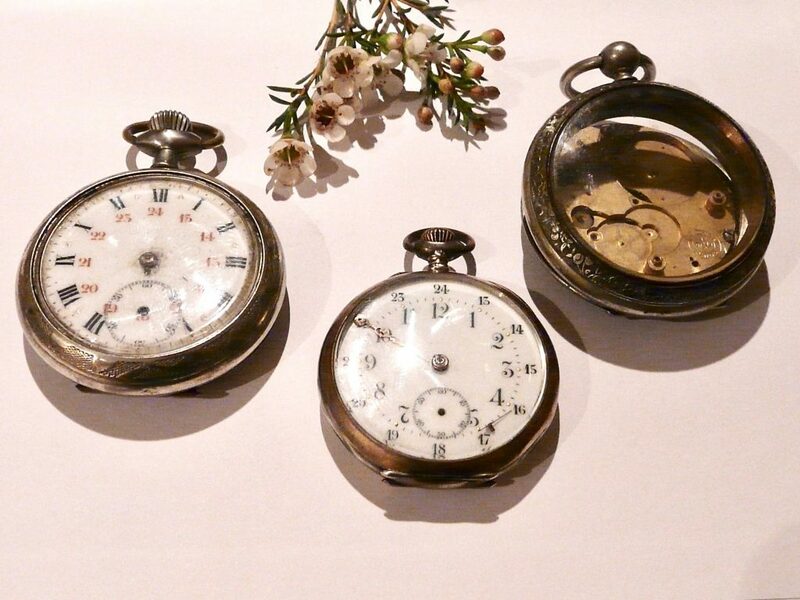 I love old craftsmanship and the idea that these watches have a story and belonged to someone. Instead of looking at the time, I created a small botanical world to look at. To make us forgot time and to be in another world for an instant. My husband helped me removing the wonderful inside clockwork to make room for my porcelain creations. 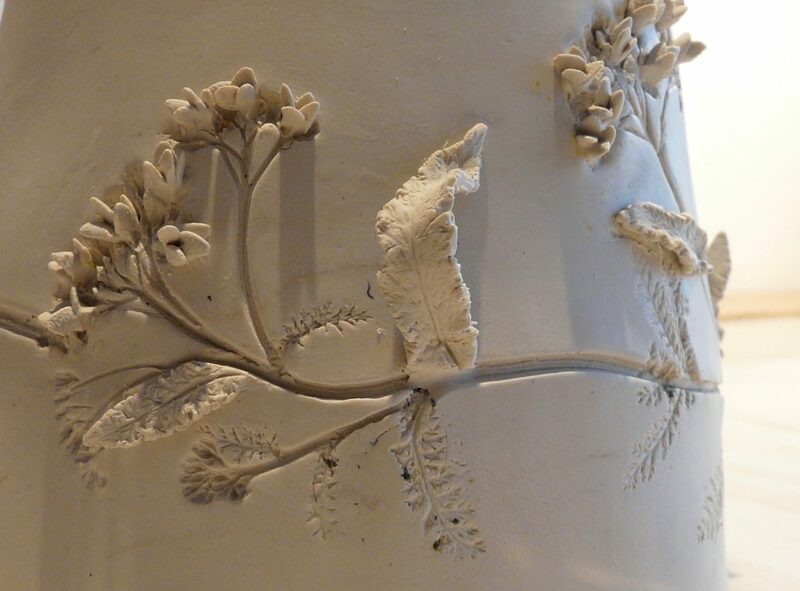 Imprints of real flowers and sculpted flowers make a new botanical composition. Trying out different designs and compositions for the new clockwork! Something else I’ve been working is, is the lightning for my new studio. As we are now finishing off all the work in my new studio in our garden, it’s time to make the lightning. We have build the new studio by ourselves and tried to do it in a sustainable way. So, for me, it’s logical to also make the lamps myself. And I can design them completely to my own style and preferences. This means they need to have a botanical look, with flowers and leaves! Porcelain lamps gives such a wonderful and warm light, and they look very natural. A detail of the sculpted flowers and leaves of yarrow on this lamp. Leaves of mint and lady’s mantle on two other lamps. 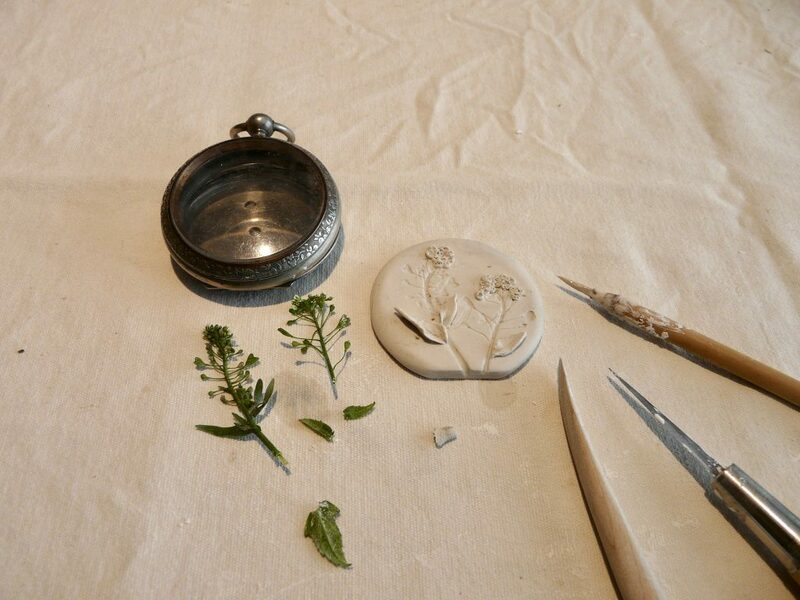 The light will shines delicately trough the imprints, which will give them a fairylike look. and blow some lovely snowflakes your way! WAW wat een pracht ontwerpen: de oude horloges waarin de tijd wordt omgezet in natuur! Heel origineel. We wensen je veel natuurinspiratie. Dank je wel voor je lieve woorden! Het is leuk om te horen dat je het een mooi idee vindt.